Maintenance is easier with asphalt roads but concrete roads require very little or no maintenance. 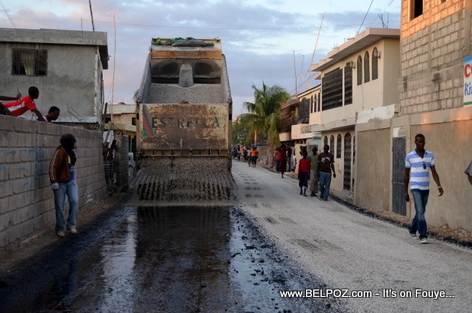 I was wondering why the Haitian Government decided rebuild the roads inside Delmas (Port-au-Prince) out of concrete when I figured it was definitely more expensive than asphalt. I guess it is because it will last longer. SO... Which do you think is better for Haiti? Asphalt of Concrete? i came across your grandfather's name while researching the "United Haiti Corporation" c.1904 - 1920s? i really don't know what happened with "United Haiti Corp." they were supposed to build a railroad of 300 miles, but its unclear what happened. My grandfather, F. Henry Berlin, who was an and American civil engineer, in partnership with John C. Marsh, built the concrete roads in Port Au Prince at the beginning of the 20th century. When I visited in 1973, most were still in use. M panse ni youn ni lot pa beneficiant en Haiti a cause de corruption. Ke se concrete, ke se asphalt contractors Haitians ap cut corner pou yo fe maximun profit. JUST gade en comparaison in troncon route ke Estrella fe ak youn VF fe?